On February 11, at the Korston Entertainment Complex, speaking at a summing up meeting of the Ministry of Transport and Roads of the republic, Tatarstan Prime Minister Aleksey Pesoshin said that Tatarstan is the most important part of the production infrastructure of the republic and provides daily activities of people, contributes to the accomplishment of social and economic goals of the republic, provides conditions for maintaining economic growth rates, improving the level and quality of life of people. Russian Minister of Transport Yevgeny Ditrich, Aide to Russian President Igor Levitin and other officials. 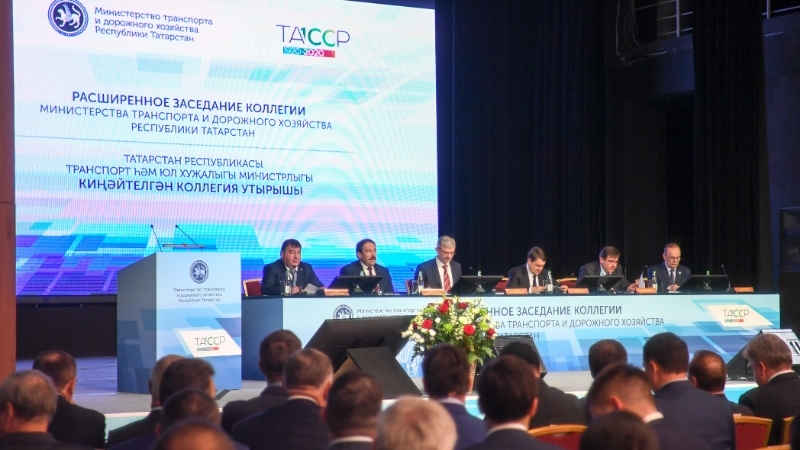 Minister of Transport and Roads of the republic Lenar Safin made a keynote report on results of work of the regional transport sector in 2018 and tasks for 2019. Speaking at the meeting, Pesoshin noted that to thoroughly implement the tasks set, the transport sector should keep up with the times, meeting the most severe modern requirements for traffic performance, the state of the transport infrastructure, traffic control and security. Pesoshin draw the attention of the Ministry of Transport of the republic and heads of regions to work of the public transport. “New roads, stopping sites are built, however transportation in some regions has not been arranged. I would like to stress once again that the traffic safety and the affordability of transport services to the public should remain the main priorities in the activities of the transport sector,” he said. The Prime Minister of the republic and other officials, who spoke at the meeting, emphasized that the road safety is the most important issue. As noted at the meeting, 377 people died and 5651 were injured in more than 4580 road traffic accidents registered in the republic in 2018. Pesoshin continued that the Safe and Quality Roads federal project, which has become an integral part of the national project, plays an important role in the road safety. “I sincerely thank the Government of the Russian Federation and the Ministry of Transport of Russia for including Kazan and Naberezhnye Chelny in this project. This year Nizhnekamsk and the regional network have been included in the project as well,” Pesoshin said. He noted that due to this about 2.7 billion roubles from the federal budget this year.